No one does weddings like Hard Rock! Love Rocks. For an all-inclusive experience for the whole family, Hard Rock Hotel’s awe-inspiring properties in Mexico and the Dominican Republic make for a memorable getaway. Inspired by rock and roll, these hotels deliver a luxurious and lively atmosphere for guests of all ages. Plan on receiving the star treatment at these properties and experience magnificent accommodations fit for rock stars. Great beaches, extensive pools, decadent food, and night and day activities make these hotels a unique retreat for everyone. All rooms at Hard Rock include all meals, snacks, drinks, room service, in-room mini bar, wifi and phone calls to the US. We also include the shuttle between the airport and hotel. Weddings at Hard Rock are awesome! They have everything from a complimentary package to a completely customized package and everything in between. Their wedding office is in Miami, which makes planning very easy. Resort Credit for all guests! Bookings of 3 nights receive $500 USD. Bookings of 4 nights receive $750 USD. Bookings of 5-6 nights receive $1,500 USD. Bookings of 7-8 nights receive $1,800 USD. Bookings of 9-11 nights receive $2,000 USD. Bookings of up to 12 nights receive $2,500 USD. A 20% service fee will apply to all products and services purchased with the Resort Credit. Resort Credit may be used for the following activities (activities may vary and may not be available at all properties): Golf, Tours, Romantic Dinners, Wine Tasting, Lobster Dinner, Rock Spa®, Rock Shop®, Wedding Collections, and much more! Group Benefits for the bride & groom! 5-9 rooms booked for a minimum of 3 nights or 15-19 room nights = One (1) cocktail reception for one (1) hour. 25-74 rooms booked for a minimum 3 nights or 75-224 room nights = Punta Cana: Two (2) private functions for three (3) hours. (May be a cocktail reception, dinner or both with a maximum of three (3) hours per day). Mexico: Unlimited private events for up to three (3) hours each day. 75-99 rooms booked for a minimum of 3 nights or 225-299 room nights = Punta Cana: Two (2) private functions for four (4) hours (may be a cocktail reception, dinner or both with a maximum of four (4) hours per day). Mexico: Unlimited private events for up to four (4) hours each day. 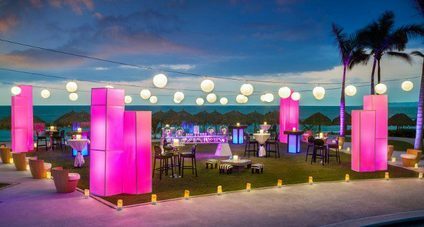 100+ rooms booked for a minimum of 3 nights or 300+ room nights = Punta Cana: Two (2) private functions for five (5) hours each day (may be a cocktail reception, dinner or both with a maximum of five (5) hours per day). Mexico: Unlimited private functions for up to five (5) hours each day. Subject to hotel changes. Free Nights for the bride & groom! ​With your Hard Rock wedding group, you'll receive one (1) complimentary room night for every ten (10) room nights paid up to a maximum of seven (7) complimentary room nights.